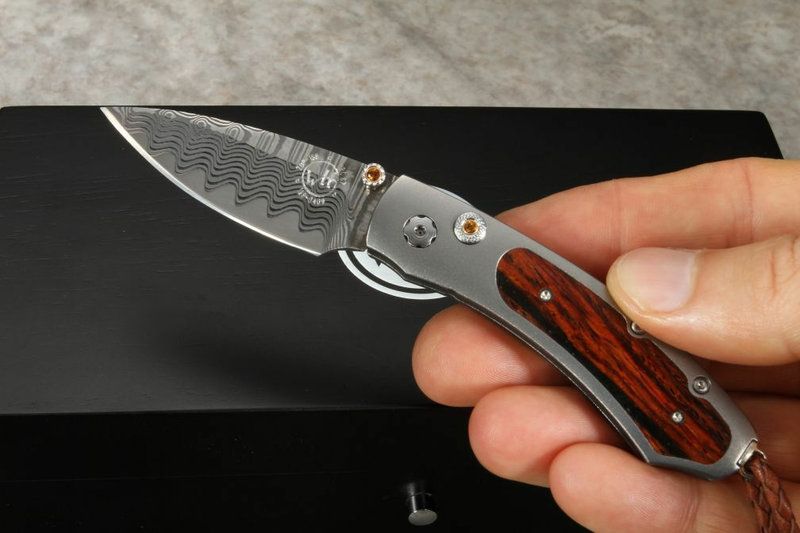 If you are looking for an upscale compact folding knife, the Shiprock will fit your desires. 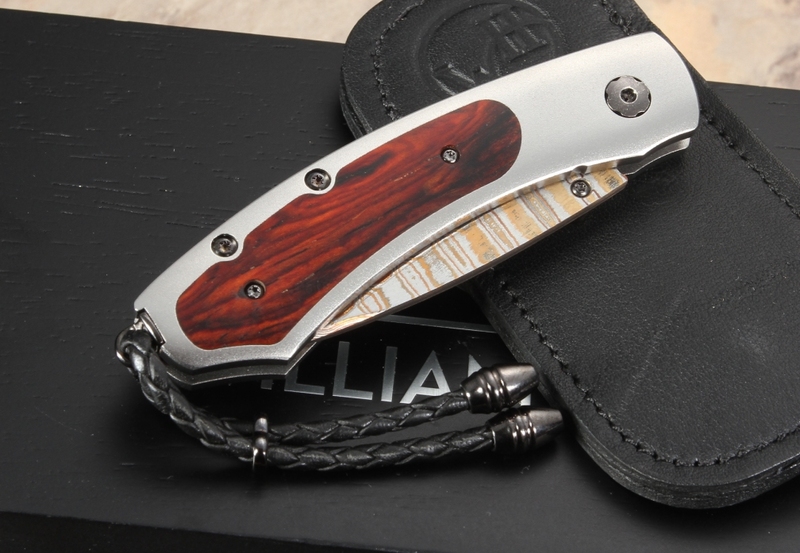 The American-made William Henry B09 model features 'Wave' pattern damascus steel, aerospace grade titanium handle frame and an inlay of exotic cocobolo wood. The blade on the knife is forged 'Wave' pattern damascus with a cutting edge of ZDP-189. This provides the user with the best of both worlds - unique damascus pattern and the performance of high-end cutlery steel. The blade opens smoothly with one hand thanks to the thumb lug. The handle of the Shiprock is an interframe of titanium and inlaid with exotic cocobolo wood. The titanium allow provides the user with a durable, strong yet very lightweight build. The knife securely locks open with the button lock construction. The button lock and the thumb lug are inlaid with decorative citrine gemstones. The B09 Shiprock is a special limited edition of only 500 individually numbered knives. 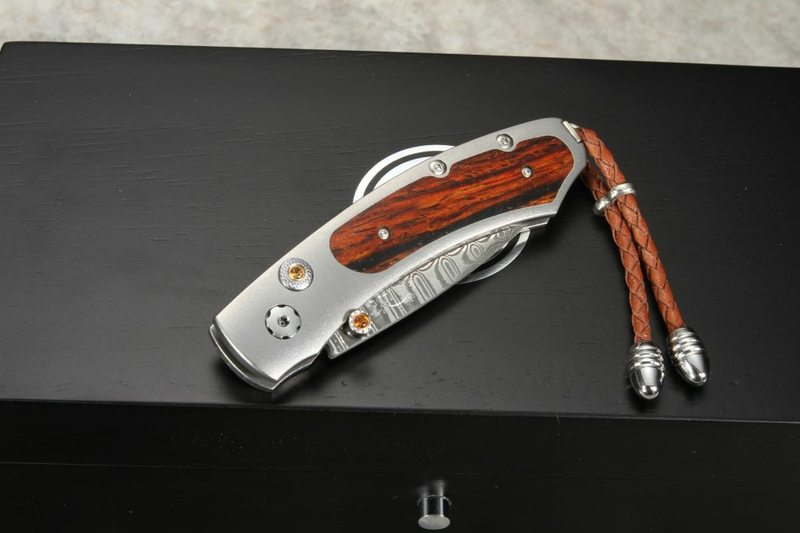 This knife features a sterling silver bale, braided leather lanyard with stainless steel beads, and matching brown leather ClipCase for safe carry and easy access. 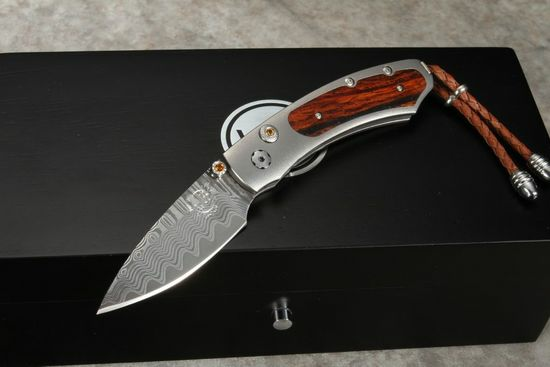 A unique serial number is engraved into the blade and every knife includes a Certificate of Authenticity and attractive wood presentation box. Order this William Henry with confidence, we individually select each knife model to be best-in-class. We ship the same business day with fast, free US shipping. All items are new and carry a full warranty as an authorized dealer. It's a knife of superlatives. Sharp as a razor. Smooth as silk. Classic design. a pleasure to hold and admire. The workmanship is superb. I could not be more pleased. And thank you for fast delivery.